Jaws dropped as a Sukhoi Su 30-MKI seemed to rip the sky apart emphasizing the adage “even the wind stops to stare” when this bird flies. BENGALURU: Bengaluru’s signature air show, Aero India 2017 got off to a roaring start on a warm Tuesday morning with aeronautic technologies from India and other countries show in stunning displays. It began with a flypast with Mi17 helicopters carrying the flags of India and the Indian Air Force (IAF). First up on the show was the Light Utility Helicopters (LUHs) made by Hindustan Aeronautics Ltd (HAL) enthralling the audience with their sideward and the tailslide manoeuvers. The helicopter formations were escorted by Cheetahs. This was followed by the Rudra and Dhanush formation of ALH Mark IV. This was a perfect amalgamation of Russian technology and Indian avionics. The Gripen ‘swing role’ fighter, capable of switching roles at the push of a button, gave a further high to viewers at Aero India 2017. Even though the Rafale can zoom past at 1,400 km/hour, slow speed is important for deception and unpredictability in combat. And the aircraft provided just that when it slowed down to 180 km/hour as though giving a chance to shutterbugs to frame it. Though the Suryakirans were lesser in number and were flying in formation with the new AJT (Advanced Jet Trainer) Hawks, they looked magnificent for this was their 500th display after their first formation flight way back in 1996. With their ‘figure of eight’ and spear formations, it was metaphoric of IAF’s capability to strike deep and hard with precision. The red and yellow metal birds also paid tribute to Air Force Station Yelahanka by flying in a Y formation. 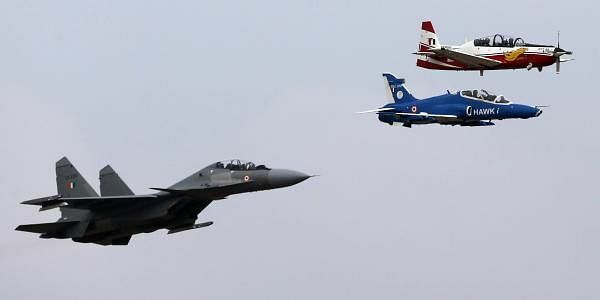 Air defence officer Capt Shantanu Chakravorty said the Rafale and Tejas had the best displays and it would have been better if more fighter jets were displayed. “The F16 didn’t impress much though,” he said about the US fighter jet. The audience were left wanting for more as the Sarang team flew towards the end of the inaugural.